The loud statement, big and bold, was the first thing I saw on the windows of the world headquarters in Harlem of the Black Hebrew Israelites. There are faiths that people may be hesitant to understand. Some wouldn’t dare walk through the church doors because of the group’s radical theology. And the Black Hebrew Israelites are one of those faiths that many would pass by. 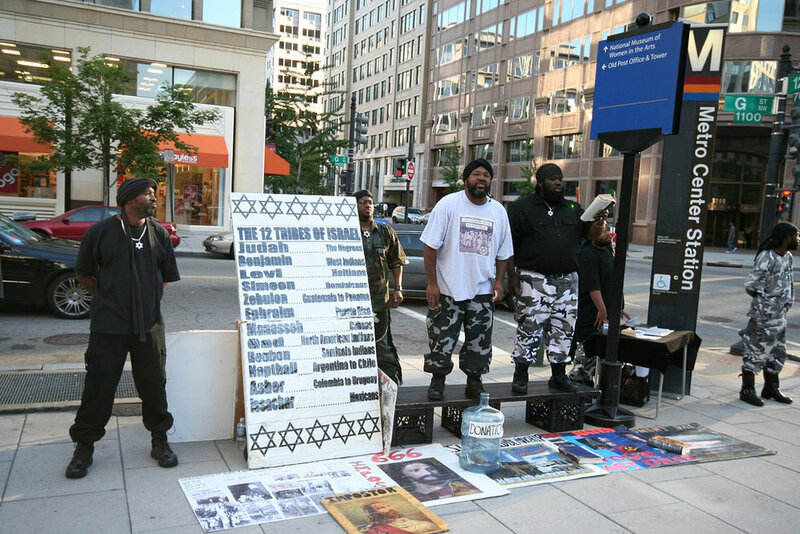 Due to their involvement with the Covington Catholic students at the March for Life in Washington D.C. last month, the Black Hebrew Israelite religion has been in the limelight. For people who may wonder who they are and what they believe, I took a train up to Harlem to attend a Monday class at The Israelite Church of God in Jesus Christ to provide some insight. The movement is believed to be started in the 1800s rooted in Black Judaism. There are Several key players who are influencers of the faith. The book “The African American Religious Experience in America” by Anthony Pinn recounted the events of the suggested person that began such teachings. The Prophet F.S. Cherry, who had a divine vision where he was to tell the African Americans their true identity as the Jewish people. This lead him to create a church in 1866 in Tennessee. He criticized churches for telling false teachings of Jesus being white and the teaching of white Jews. From there a long line of people helped usher in the Black Israelites faith. It was raided by police in 2016. “Those whose fathers are of Negroid and Indian descent make up the 12 tribes of the nation of Israel,” the church's literature says. Its extremist leaders preach that modern-day Jews are devilish impostors and white people are evil personified, deserving of death or slavery. For the past 16 years, Jermaine Grant, 38, known by his “Hebrew name” Tazadaqyah, has been the “chief high priest” of the Israelite Church of God in Jesus Christ. He has been described as a former rap music label owner and restaurateur with a “highly charismatic” personality. DNAInfo reported in 2016 that Grant “once prophesized that "a vengeful black Jesus would soon return to earth to kill or enslave all whites,” according to the SPLC. Armed with this knowledge, I walked to the church headquarters at 1941 Madison Ave in East Harlem, anticipating what I would experience. Upon reaching the building, I knocked on the door since the doors appear to be always locked). A man came out and asked me questions. “How did you hear about the church?” and “Are you familiar with the faith?” After I answered his questions, he went back inside. After several repetitions of that, he finally invited me in for class, but not before telling me that, if I was on my period, I couldn’t go in the building because I would be considered unclean. Before I could get into the sanctuary, I underwent a routine security check. I was searched for drugs and weapons and was asked to give my phone to security. When I asked why I had to give up my phone, they responded that it was for security concerns. Entering the sanctuary, I walked past two doors that had the Star of David. Inside two man, dressed in traditional wear, identified themselves as the high priests. It was clear from the class that the only people that “loved” by God were minorities. “Minority groups, the ones that are lesser than — we are the ones called to serve him. Jesus Christ loves Israel. Our people are lost because they have been lied to by the European people,” said the high priest. Every man who prays or prophesies with his head covered dishonors his head. 5 But every woman who prays or prophesies with her head uncovered dishonors her head—it is the same as having her head shaved. Similarly to many churches, they emphasize keeping the word of God. “Our job is to tell the world because, if we don't do what He commands, that’s going to be on us,” said one high priest. Over the course of three hours, the priest read scriptures giving little context, and jumping around from scripture to scripture. It was hard to understand some of their conclusions and I wondered why he skipped around so much. This confusion must’ve shown on my face because the High Priest answered. “If you’re wondering why we skip through verses, that’s because it's how you get understanding of the word,” he said. According to them, keeping God’s message is much more severe in a world that teaches the false Gospel. They made that clear in the class. “There is no other church on planet earth that will teach you the true word of God. Other churches are the Anti-Christ. You must be a part of the Israelite church to hear the truth,” said the High Priest. According to the Black Israelites, the times are evil and getting worse. I was surprised to hear what measures they took for their congregation as well as the kind provisions they made for their members. “We have a counselor set-up for members of the congregation. We want them to have a healthy outlet to release all the anger and frustrations. We know what build up emotions can do, and we don’t condone violence,” said the high priest. It’s easy to look at this group of people and write them off as crazy. The Bible warns Christians about the danger of false teachings. I appreciated the opportunity to visit the Black Hebrew Israelite service and to understand more of what they teach and believe. I also left feeling sad and hurt, feeling that some of my people - my brothers and sisters - are lost. And for lost siblings, all I can do is pray. Princess Jones is an intern with ReligionUnplugged and a news assistant at The New York Post. She is a recent graduate of Trevecca Nazarene University in Nashville, Tenn., and an alumna of the NYC Semester in Journalism (NYCJ) program at The King’s College in NYC.